An impromptu piece of close-up mentalism that uses no gimmicks in which you demonstrate clairvoyance (or mind-reading), then your participant does - and then you finally show that you had predicted everything! The effect: You and your participant each have a collection of coins before you on a table. You and she take turns secretly flipping over your own coins until she is completely satisfied that neither of you could possibly know the heads-tails orientation of the other’s coins. You now cover a coin of yours and she covers one of hers. Yet you are able to tell the orientation of her covered coin – and then she is able to do the same for yours. Finally, you reveal that you had predicted both results ahead of time. 1st edition 2016, 4 pages + video. 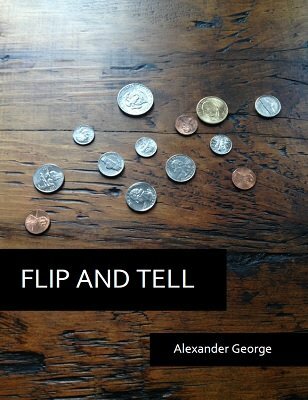 Flip and Tell uses a 50-year-old Martin Gardner principle dressed up in a new routine. If you watch the video, you'll see exactly how it plays out, and if impromptu effects are to your liking, you'll like this. It reminds me of something that you'd see in one of Mark Elsdon's Conversations as Mentalism books (He's up to four now. Get them all because they're great.) in that you can do it anywhere on the spur of the moment with just a bunch of coins, a wallet, and a flat surface. By itself, it's not an effect that will get you your own BBC mentalism series, but as a supplement to a "which hand" or positive/negative routine, it's nice and quite baffling. I followed the instructions, turned coins over, and BAM! It works great. There is one small move, and if you watch the video a few times, you probably can figure out the essence of what it is, but when you do it once for a spectator, it will fly by without much thought. And the price is around you'd pay for a single trick out of one of Elsdon's "CAM" books. In other words, here you have a slick, inexpensive impromptu effect. It's one of many different propless or nearly propless things that I can do. Recommended.